So, here’s what I decided to do with Caribou and Take Me Out to the Ball Park. 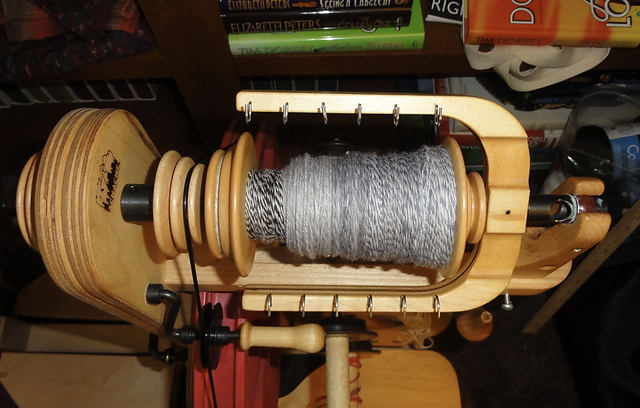 I took one bobbin of Caribou and wound it on my ball winder to make a center-pull ball, then I plied from both ends of the ball to make a 2-ply. Bobbin #1 of bump #1 is now a 2-ply spun from a center-pull ball. The entire brown section is hidden under the gray. We will have to wait until I wind the yarn on my niddy noddy to see just how spectacular (or not) the finished yarn will be. This probably wasn’t the best colorway to use for this method because the colors are not repeating, and each color is very long. I think it would work better with a colorway that has short color repeats and lots of different colors. But it is a technique I really wanted to try, and I ended up with a beautiful marled 2-ply, although the picture doesn’t show just how much color variation there is in this yarn since most of it is hidden. I am going to chain-ply the other bobbin of singles. I don’t know how I will end up spinning and plying the other bump of Caribou, but I am pretty sure I will do something completely different from what I did with the first bump. Take Me Out to the Ball Park ended up as a 2-ply, just as I originally intended. I’m so happy that I stuck to my original plan. 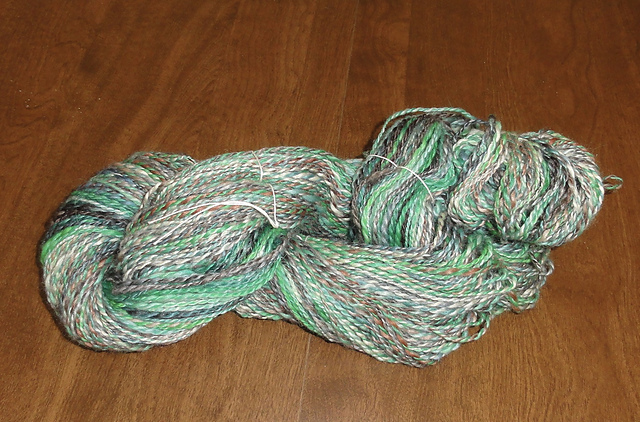 Here’s the skein straight off the niddy noddy. It will look a little more organized once I have set the twist. Here’s the obligatory close-up shot. 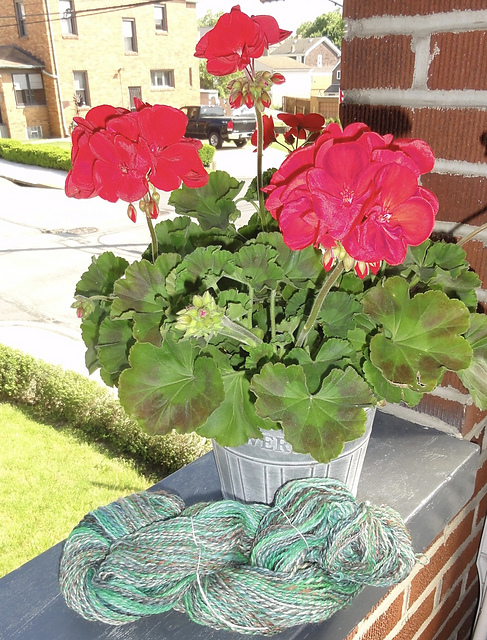 A skein of handspun just hanging out on the front porch with a geranium. 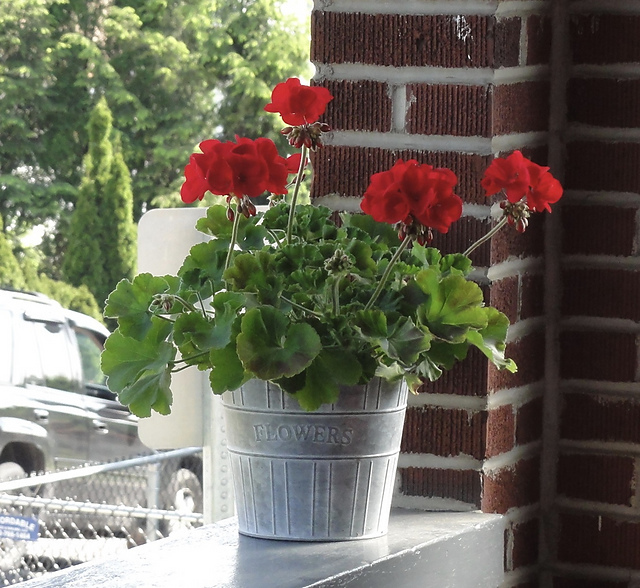 I included this picture because–GERANIUMS!